Please contact customer services to change your delivery address or IP addresses. Please include your full name, postal address and invoice number if contacting us by post or e-mail. Latin Lawyer has an open editorial policy. Please contact the editor with comments or ideas, or to notify us of any corrections. We publish corrections at least as prominently as the original mistake and will make corrections quickly and candidly. Please find more information on how to submit news, our editorial calendar, or on submissions for the Latin Lawyer 250 on the relevant pages. 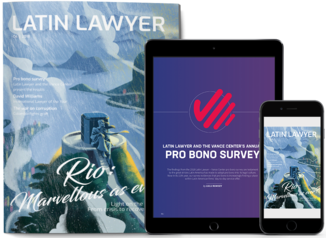 Latin Lawyer offers a range of online and print advertising opportunities, targeting a niche audience of private practice, in-house counsel and academics with a focus in business law in Latin America. Latin Lawyer can supply reprints of either individual articles or special reports to suit your needs. These are ideal for presentations, promotional and marketing activities or as part of a press pack. Prices vary according to quantity and specific requirements. Please contact us for a quote. 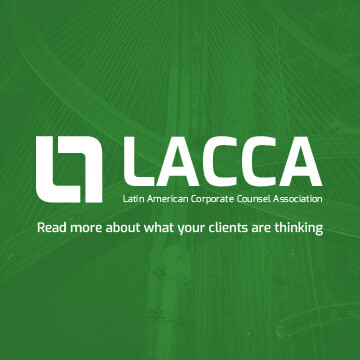 Latin Lawyer and LACCA are published by Law Business Research. Other publications include Global Arbitration Review, Global Competition Review, Global Investigations Review, Global Restructuring Review, the Getting The Deal Through series and Who's Who Legal.